THE China Railway Construction Engineering Group (Papua New Guinea) Real Estate Company Ltd has assured Papua New Guinea of its commitment to invest in the country. It is the sister company of CRCE (Papua New Guinea) Ltd. It recently injected K118 million initial equity investment to its first flagship development project – a 23-storey office building in the central business district of Port Moresby. General manager of the developer Shengwei Li said the group had been working with the Papua New Guinea people and Government for almost 10 years in the construction business and had delivered a series of projects in the country. “We are assuring the Papua New Guinea people and the Government that as a State-owned enterprise, and guided by the Belt and Road policy, our company is confident with Papua New Guinea’s economy and will continuously support the nation’s economic development,” he said. “The proposed commercial development project consists of 11 floors of office building and seven floors for the car park, with sky garden and cafeteria. “Total investment is estimated to be over K250 million, making it the single largest project by foreign investors in the real estate sector of Papua New Guinea. 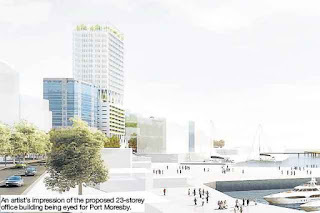 “The project, once completed, will become a contemporary office building and the tallest landmark in Port Moresby.